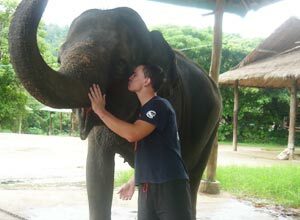 Korey Te Hira, senior in economics and international business in New Zealand, tells us about volunteering at an elephant camp in Northern Thailand. My mate and I wanted to spend a couple of weeks in a warm place, and do something besides just going the beach. We didn’t have enough time for an extended volunteer placement so we looked for projects that would take people for only a couple of weeks. That’s how we made the decision to help out at an elephant camp in Thailand. It was an adventure from day one. We had just arrived, signed in, put our stuff in our room and right away we were helping to take the elephants for a bath in the river. 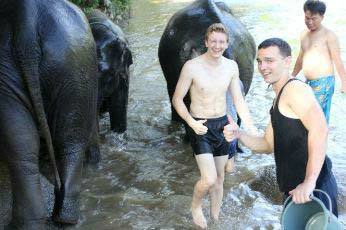 An amazing experience – we get off the bus, and in no time we’re leading elephants to the river! Bathing elephants was something we’d do twice a day. We’d get up about 6 am, and wash the elephants for about an hour. Breakfast was at eight; they’d make it to order. In fact, all the food was really good. Then from 9:30 to 10 we’d help with a daily elephant show, encourage the audience to buy sugar cane and bananas and feed it to the elephants. After a buffet lunch, we’d give elephants their medicine, clean their enclosures and things like that. In the afternoon, around four, we’d bathe the elephants again. Working with the animals, you get to know them pretty well. One was a really messy eater, one was great for trekking, and another elephant was the camp painter. Each elephant had its own trainer, who’d look after that one animal. So the staff were really good and they really knew their elephants. In between working with elep hants, we all had a fair amount of free time. That’s when we’d walk around the village, getting to know the locals. Most didn’t speak much English, but they were very friendly, warm and welcoming. One thing we really enjoyed was playing volleyball with the village kids, our coworkers, and other volunteers. I really enjoyed the volleyball as it made me feel more a part of the community, and it was a fun way to get to know the people. Being in a place like that, it’s easy to make friends. We became close to the other two volunteers, and we stay in touch with one another. We spent two weeks at the camp but wished we could have stayed a week longer. Three weeks would have been an ideal amount of time there. For anyone considering this program, I’d say do it; you won’t regret it. I’d recommend people bring books, cards and a hacky sack – stuff to entertain yourself with during the time off from the elephants. I’d also encourage volunteers to spend time in the village, getting to know the locals, to join the volleyball games. That’s when you really feel you’re doing something different, and unique. It’s when you feel you’re actually a part of the community, which is something I will never forget. More information on ELI's Thailand Programs.